For the British holidaymaker (and businessman) Portugal has a lot going for it. The weather is generally very kind, they keep to the same time zone as the United Kingdom, and with the current £/€ ratio it is cheap. 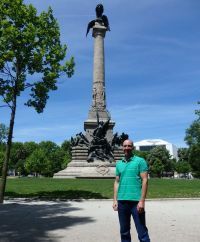 Our choice for a weekend break was Porto (Oporto was a British translation now falling out of favour) taking in a package organised by Bravo Travel. Porto is situated at the head of the Douro River, the imposing National Park on either side as it winds its way towards Spain. Porto is a World Heritage Site. It is increasingly popular with river cruises and is a regular port of call for sea-going passenger ships on their way to Southampton and Amsterdam. Scenic, the luxury river specialist, will be introducing a programme next spring, bound to be popular (see CRUISE NEWS in this issue). There are other things about Porto which cement it to Britain. The local soccer clubs most successful managers have included Bobby Robson and José Mourinho. As a Brit you are made very welcome and English is the second language taught at school. No problems if you are lost providing you talk to the younger element. In 1809 the then Major General Wellesley (later Duke of Wellington) won a spectacular victory at Porto, crossing the Douro in broad daylight and very much surprising the French! To make expats feel at home there is the Oporto Cricket and Lawn Tennis Club (founded 1855) and the Oporto British School (1894). Getting to Porto is very easy with the flight time from London about two hours. We chose TAP and were pleasantly surprised with the quality of service. It is a far superior product than Iberia. Porto’s air terminal is a very modern building, all glass and steel, and is served by a Metro line. By dual carriageway it is 10kms to the centre of the city. Besides Gatwick and Stansted a number of UK regional points offer flights, plus most European centres. Porto is in fact two cities with six famous bridges across the Douro, connecting Porto itself, to the north, with Gaia, essentially the home of Port wine, to the south. The history of Port is another story with very strong British connections, Taylors were established in 1692 and many other popular brands followed including Dow, Cockburn and Sandeman. 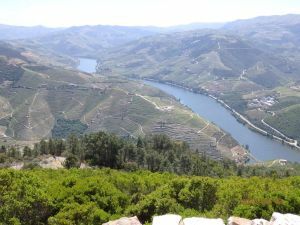 The Douro Valley is the home of Port, the river providing the transport, the Rabelo cargo boats now given over to tourism. Gaia hosts the river cruise ships and many restaurants. High up, and overlooking Porto and the Gaia wine producers' rooftops is The Yeatman, very much a 5-star hotel, each of the 78 luxury bedrooms sponsored by a different winery. The large decanter shaped outdoor pool is surrounded by a spacious sun terrace with staircase access to the gardens. Our trip was to be three nights, the first two spent at the Palácio do Freixo, a member of the Leading Hotels of the World Group. It is on the outskirts of the city, on the river and is two buildings. “The Palace” is best described as a luxury classical mansion in the Portuguese style hosting the public rooms and restaurant. Next door, with covered access, is the former mill, now with 87 bedrooms to the highest standard with a very well-equipped spa in the basement. We may find it incongruous, but in the 18th century wealthy factory owners liked to live next door to their production unit, even if the two buildings were a clash of architectural styles. As well as in the spa there is an outside pool, adjoining a bar area. Our third night was provided by Palácio owner, the Pestana Group, with an excellent property by the river and very much in the historic centre of Porto. No restaurant (except for breakfast) but there is a big choice outside the front door. Make sure you make a booking if you want to eat in the evening in the most popular dining rooms. Porto is very busy. The hotel is currently being extended along the river front and is expected to shortly double capacity. Our package included two trips on successive days, organised by Detour, a small specialist tour operator run by the Veloso brothers. The local hop-on hop-off bus was also tried and part of the old tram system has been saved, well worth trying as a rattely and fun example of times gone by. Day two was a 4x4 outing along the valley of the Douro and into the National Park, quite spectacular. Vineyard after terraced vineyard as we leisurely navigated the tracks and byways through glorious countryside, ascending the peak of São Leonardo de Galafura with a chapel at the top. The views were tremendous from what is at the weekends a popular picnic spot with the Portuguese. Lunch was taken at Quinta Nova, essentially a winery, but also an 11-bedroom boutique hotel with a fine restaurant. There is a pool and wi-fi but no TVs in the bedrooms. Very quiet, very peaceful, an ideal place to relax. The pretty little town of Pinhao is just 10 miles away. There are four trains per day from Porto with a journey time of 2½ hours. It is a lovely riverside run. Porto is fish. The market takes place every morning. São Leonardo de Galafura restaurant is a short distance from the cruise port and the extensive Avenue Du Brazil promenade in the northern suburb of Matosinhos. The tram runs nearby. Choose what you fancy and it is cooked for you in the traditional Portuguese way with the speciality Bacalhau, salted codfish, definitely one of the most popular and well known Portuguese dishes. Our final night’s dining was at the DOP Restaurant in the very centre of Porto, eagerly chasing its first Michelin star. Once the building of the S. Domingos Convent, it dates back to the 14th century and is now also part of the Palacio das Artes, dedicated to developing talented young performers and artists. The seven course ‘tasting menu’ comes with the appropriate wines, a fine way to complete a splendid break in one of the vino capitals of the world. It was a short walk back to the hotel, and it actually couldn’t be a more fitting home for one of Porto’s most creative chefs.